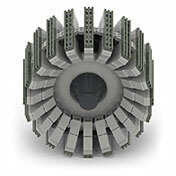 The first component of the Wheel Assembly we will look at is the wheel it self. Typically Rovers dont, have separate tyres and hubs, but rather a single wheel made from aluminum, Stainless Steel and other composites  No Rubber here. Treads and cleats on the wheels provide traction and grip for climbing in soft sand and scrambling over rocks. Wheels in contact with the ground cause resistance (friction). The amount of resistance produced is proportional to the width of the wheel, the amount of pressure applied through the wheel to the ground below, and the surface quality of the ground under the wheel. (Think of the difference in grip your standard car tyre has when traveling over different road surfaces: Asphalt vs. ice, dirt vs. sand). Rovers remain in contact with the ground is through their wheels. Rovers have limited battery power and their motors can only supply limited force to each wheel during normal operation. There are many trade-off's when designing Rover wheels. The primary one being width vs. weight. The wider the wheel, the heavier it becomes. It will have a lot of grip due to the large surface area in contact with the ground's surface, but it will also require more power to drive and turn the wheel. On the other hand narrow wheels are lighter, have reduced grip (less surface area in contact with the ground), and require less power to operate. However Narrow wheels have there own problems. They are weaker than wide wheels. They provide less stability and grip when the Rover is in operation and limit the potential field of exploration your Rover has. A high price to pay if thats what you are designed to do. This is why Rover wheels are typically wide, have a large surface area in contact the ground which supplys grip and stability over most types of terrain. YogiCub has a medium width wheel which gives us the right combination of grip, robustness, and weight. It is made from 2 LEGO® Technic Motorcycle wheels & tyres with the addition of a Technic Tread wrapped around both tyre's perimeter. The wheel design is based off Joe Nagata's wheel, tyre, and tread combo in his LEGO® Mindstorms Idea's Book. The wheel is attached to the Wheel Assembly through two perpendicular axle joiners, rather than through the center Why? See the next section. Very wide wheels require a lot of force to drive and turn them. Their large surface area supplies a lot of grip and traction, but this comes at a cost. A way to overcome this is to split the single wide wheel into two narrower wheels, and place a differential between the two. The differential compensates for each wheels movement when the assembly is being turned. Although LEGO® has a large range of wheel and tyre combinations Rover wheels seem to be cross between your typical off-road tyre and a cheese grater. 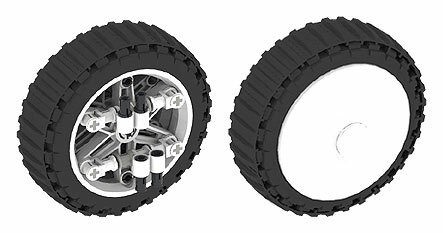 These specifically designed Rover wheels will meet the most demanding terrain any exploration mission will encounter. Available in a host of diameters and widths try a pair on your Rover now!.